State and local governments and land trusts should prioritize the protection of natural and agricultural lands to promote healthier communities and adapt to a changing climate. This requires greater collaboration between community organizations and government, increased funding, and updating of prioritization criteria. This criteria should include consideration of the land’s potential to store carbon, capture and filter stormwater, and protect the drinking-water supply. The land to be protected must support biodiversity, allow for habitat migration, increase regional food production, and offer recreational benefits. Open spaces and agricultural lands provide tremendous benefits to the region and its residents. They provide us with abundant and clean water, reduce air pollution, and protect a range of habitats for numerous species, as well as providing an opportunity to connect with and experience nature. But in a growing region like ours, these open spaces are at risk. While nearly 70 percent of our region’s land is undeveloped, only 21 percent is permanently protected, leaving too much vulnerable to future development. Many state programs—such as New York’s Environmental Protection Fund, New Jersey’s Green Acres, and Connecticut’s acquisition program, as well as private nonprofit land trusts—have been established to identify and acquire priority parcels for permanent protection, but are woefully underfunded. In this situation, when demand for funding is high, the current criteria for determining which parcels should be prioritized for acquisition are outdated. They do not reflect the most critical challenges we face in the era of climate change, which brings greater risk of flooding, droughts, and threats to our natural habitat. Climate mitigation: Because forests have the capacity to store large amounts of carbon, protecting swaths of unprotected forest will help mitigate carbon emissions and slow the pace of climate change while we transition away from greenhouse gas-emitting fuels. Flood resilience: Open spaces and agricultural land absorb water. Protecting these spaces in areas that are susceptible to flooding can help reduce damage to our communities. “Flood farms,” an innovative concept advanced by PORT + Range in the fourth plan’s 4C Initiative, are marginal agricultural lands protected and used to absorb riverine or storm floodwaters conveyed to the site. Flood farms could offer a new source of income for farmers on marginal lands, or a reason to prioritize agricultural-land protection. Natural species protection: Some land parcels are particularly important for protecting animal species and giving them routes to migrate northward, as the climate warms and ground conditions change. Local food production: As farms across the country become increasingly susceptible to drought, it is important to protect the most fertile agricultural land and expand the opportunity to grow more food regionally. Community health & well-being: It is critical to protect open spaces that ensure a high-quality drinking-water supply for a growing population. Land that gives the region’s residents access to nature also has important health benefits. Using the criteria above, RPA identified nearly 237,000 acres of high-priority unprotected open spaces with multiple overlapping benefits. Each state in the region should increase the funding dedicated to preserving open spaces and agricultural land, and make long-term investments to ensure they are protected. Across the country, such measures enjoy wide support from the public, with many statewide and municipal ballot measures to create new public funds for parks and land conservation having been approved. Once each state has agreed on the prioritization of open spaces and agricultural lands, a bond initiative should be pursued to raise the needed funds. Preserving farmland requires creativity, perseverance, and greater collaboration between all interested parties. A good model for collaboration to preserve farmland is Scenic Hudson’s Foodshed Conservation Plan, which brings together rural communities dependent on agriculture and city neighborhoods seeking fresh food. The plan rightly calls on federal, state, county, town, village, and New York City participation in the effort. Strategically protecting open spaces and agricultural lands, instead of simply preserving as much open space as possible, would result in greater resilience against flooding, more reductions in greenhouse gases, cooler temperatures, greater biodiversity, stronger local economies, and healthier communities. In particular, this would lead to preservation of the most fertile and economically viable farmland; forests that absorb carbon and clean the air; and trails that connect communities to nature and allow species to migrate as the environment changes. This strategy would be the most cost-effective from an economic and environmental perspective. It would result in cleaner and more abundant drinking water, fewer people with chronic diseases caused by air pollution, fewer deaths from extreme heat, and more secure access to local and regional food. Incomes would be higher and unemployment lower in some of the most economically depressed areas of the region. More people would be able to walk, bike, or use a wheelchair to get to the region’s natural landscapes. Finally, prioritized protection would allow for strategic partnerships across governmental jurisdictions and among different land conservation groups that would help ensure the protection and stewardship of these critical places for generations to come. Over the past 20 years, New York, New Jersey, and Connecticut have spent a combined $1.3 billion of environmental protection and acquisition program funding to protect about 200,000 acres of open space (not including coastal wetlands). Additional funding will be needed to protect high-priority portions of the region’s 3.9 million acres of unprotected open space. In combination with legally and politically appropriate land use regulations, changing the criteria to reflect current priorities around climate change will allow funding to have a greater impact. 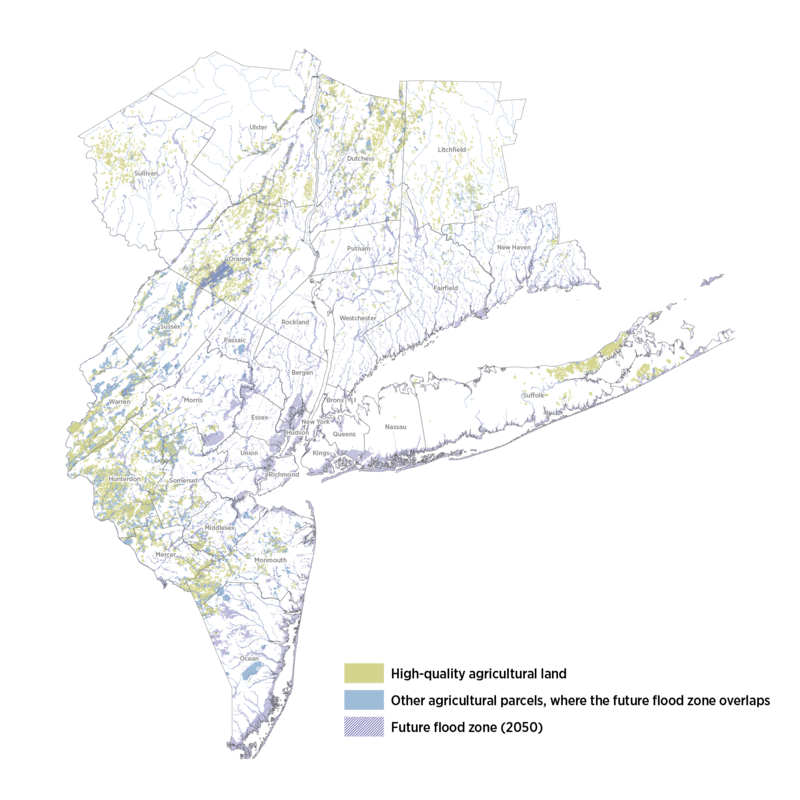 The Nature Conservancy, Scenic Hudson, RPA, and others have developed different models that can be expanded and improved.